The previous two away games served up very different performances, so I travelled to Charlton hoping for something more in the style of QPR than Derby. There were five changes in personnel from Saturday with McGugan and Ekstrand injured, Cassetti suspended and Pudil and Ranegie rested. 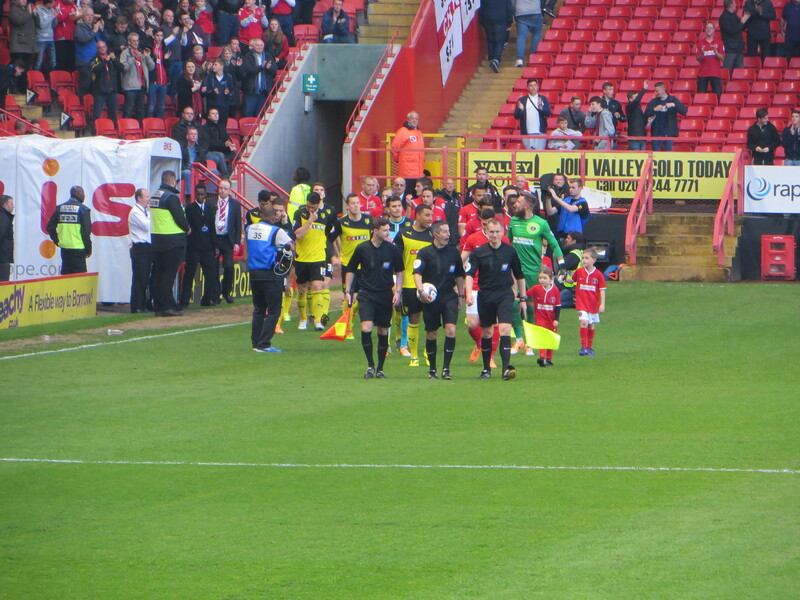 The starting line-up was Bond, Belkalem, Hoban, Doyley, Riera, Murray, Tözsér, Battocchio, Faraoni, Anya and Deeney. 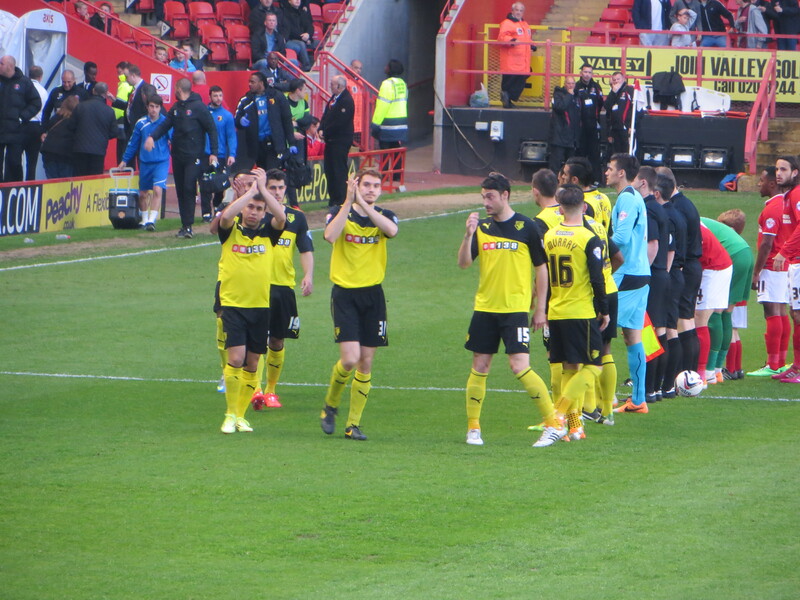 Charlton’s team included Watford Academy graduate, Sordell, and former loanee, Jackson. 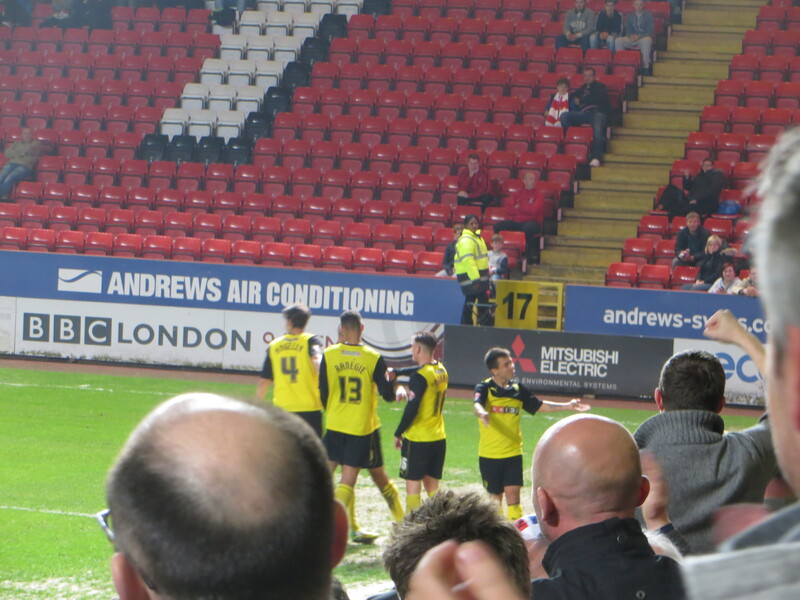 visitors should have equalized soon afterwards as a through ball from Battocchio was blocked and rebounded back to him, he passed to Deeney whose shot was pushed around the post by Hamer. From Tözsér’s corner, Belkalem’s header was on target and had to be pushed onto the crossbar by the keeper. Another corner from Tözsér was a little too deep, but was knocked down to Anya whose cross flew over the bar. Murray was the next to try a cross, but it was caught by Hamer. On the half hour, Battocchio played a short pass to Murray whose shot was just wide of the target. Watford had another chance to draw level, but a lovely cross from Anya was headed back across goal by Ranegie, when he should have tested the keeper, and went out for a corner from which Hamer pushed the ball out for a throw. In time added on at the end of the half Belkalem was booked for a foul on Wilson who went down as if he’d been punched following what appeared to be minimal contact. So we reached half time a goal down. In the away end, a singing section had gathered, but they had positioned themselves at one side of the stand which meant that very few of the songs were taken up elsewhere. So, despite my attempts to join in, it was rather quiet where I was located just to the left of the goal. The first action of the second half was the substitution of Doyley by Angella. I am one of Lloydy’s biggest fans but he’d had a mare. 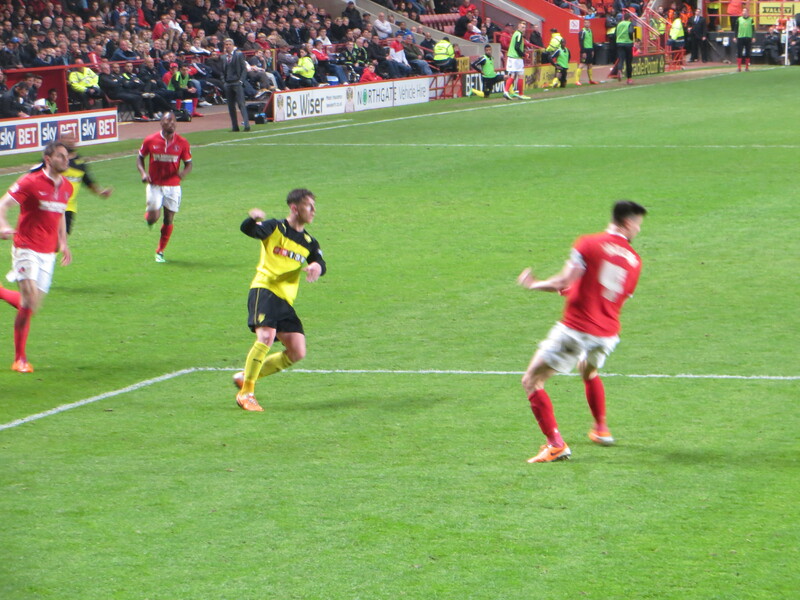 Soon after, there was a lovely Watford move as Murray played a through ball to Battocchio who fed Deeney. Hamer came out to save, but Troy had already been flagged offside. Harriott threatened again with a swift break, but Hoban intercepted and won a goal kick. That was good work from the youngster. On the hour, Watford drew level as Deeney controlled a ball from Angella, shrugged off the attentions of the defenders and hit a lovely shot into the roof of the net. It was a rare moment of quality that appeared to come from another game. Riera was booked for a trip on Poyet. Sordell had failed to make an impression against his former team and was replaced by Obika. 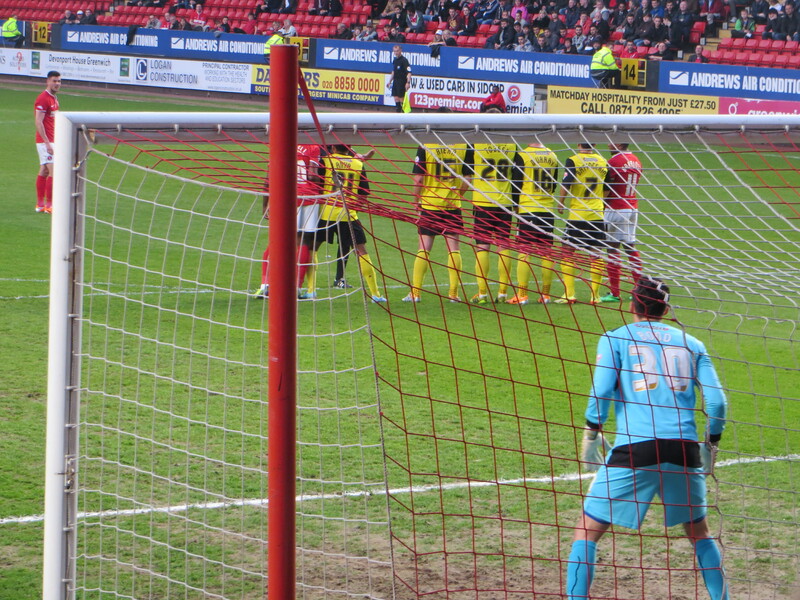 Deeney tried a shot from the right of the box that was over the target. Troy had another chance as he received a through ball from Ranegie, but he couldn’t control and it rolled through to Hamer. The home side launched a counter attack that culminated in Jackson shooting past Bond to regain the lead. There was a frantic period in the Charlton box as Angella and Deeney exchanged passes, but a defender took the ball off the Italian’s feet to stop the threat , Anya had a shot that was blocked and then Hamer was called into action to punch away a couple of crosses. With 15 minutes to go, Murray was replaced by Diakite, a move that was met with great excitement from the woman sitting behind me who was raving about the loanee and clearly must have seen something that I’ve missed in his previous outings. 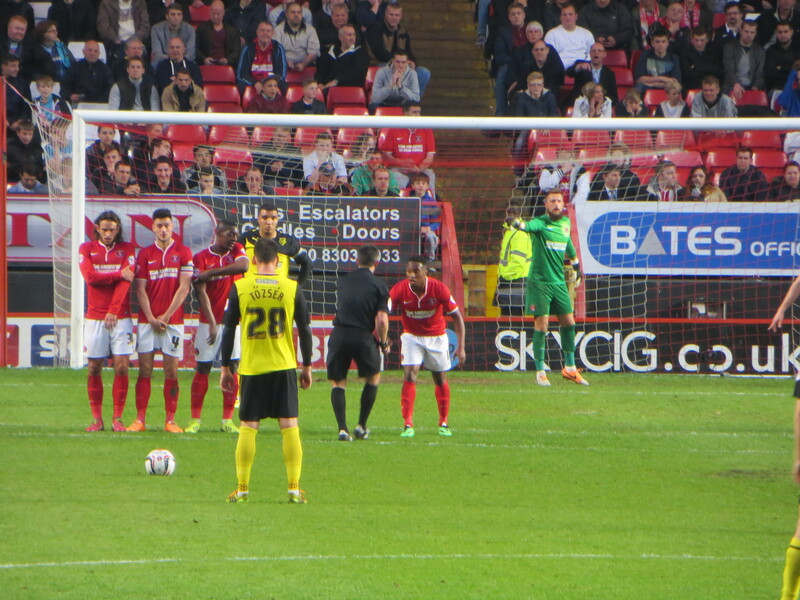 Diakite’s first action was to give away a free kick from which the ball reached Harriott who powered a shot past Bond for Charlton’s third. We never looked like getting back into the game after that. Diakite had a shot blocked before Riera came in to make a clearance, Poyet ran across and appeared to bounce off him and went flying. The referee bought the theatrics and Riera received a second yellow. He remonstrated with the official and Deeney approached Poyet and looked as though he was going to inflict an injury commensurate with his dramatic reaction. Less than 5 minutes later, Poyet succeeded in adding Ranegie’s name to the ref’s collection. Then, as Angella failed to clear, Fox shot wide of the far post. In time added on, a Hoban cross came to Anya with his back to goal. There were some in the away end who believed he’d propelled the ball across the line, but it appeared to me that Ikechi had actually kept the ball out, possibly using his arm in the process, although I would be interested to see a replay. The last action of the game was a shot from Anya that was straight at Hamer. So we lost our last away game of the season and the home crowd celebrated survival, which was some consolation as I quite like Charlton. Reading my notes back, we were competitive in the first half but, once we went a goal down, we never looked like getting back into the game. We’ve been poor on our travels for most of the season, but those last two performances were abject and have had me questioning why I bother if the players don’t. Still, I know that come the end of May I’ll be itching for pre-season. I’m a glutton for punishment. This entry was posted in Watford FC and tagged Albert Riera, Andy Hughes, Ben Hamer, Callum Harriott, Charlton Athletic FC, Chris Solly, Cristian Battocchio, Daniel Tozser, Diaki, Diego Poyet, Dorian Dervite, Essaid Belkalem, Gabriele Angella, Ikechi Anya, Joe Pigott, Johnnie Jackson, Jonathan Bond, Jonathan Obika, Jordan Cousins, Laurie Wilson, Lloyd Doyley, Marco Davide Faraoni, Marvin Sordell, Mathias Ranegie, Michael Morrison, Morgan Fox, Sean Murray, Tommie Hoban, Troy Deeney, Watford FC on April 30, 2014 by franelynn. Thanks Fran I enjoyed reading all your reports this season especially the away games even when I’ve been in attendance. I’m sure it’s been a chore at times as I know our performances have not exactly been inspiring but being a Watford fan does not follow any sort of pattern except the need for hope and the likelihood of disappointment in large helpings.